Saudi Prince Mohammed Bin Salman in India Live Updates: Saudi Crown Prince Mohammed bin Salman on Wednesday said that terrorism has been a concern for all but refrained from naming Pakistan which has been providing supports to several terror groups included JeM of Masood Azhar. Crown Prince Mohammed Bin Salman Visit in India Live Updates: Saudi Arabia will invest USD 100 billion in India – a huge vote of confidence in the Indian economy. Prime Minister Narendra Modi welcomed the announcement by Saudi Crown Prince to invest in areas like energy, refining, petrochemicals, infrastructure, agriculture, manufacturing, etc. Earlier in the day, Saudi Crown Prince Mohammed bin Salman bin Abdulaziz Al Saud said that terrorism has been a concern for all but refrained from naming Pakistan which is facing tremendous pressure from other countries for its failure to crack down on terror outfits operating from its soil. “Extremism and terrorism are our common concerns. We would like to tell our friend India that we will cooperate on all fronts, be it intelligence sharing. We will work with everyone to ensure a brighter future for our upcoming generations,” he said after holding bilateral talks with Prime Minister Narendra Modi at Hyerabad House. In his remark, PM Modi said that Saudi Arabia is among India’s most important strategic partners and the two are on the same page in the fight against terrorism. “Barbaric terrorist attack in Pulwama was a symbol of anti-humanitarian threat world is facing,” he said. The PM also said that they vowed to take economic ties to new level, adding that time has come to transform our energy cooperation into a strategic partnership. The Saudi Crown Prince arrived here last night on a two-day visit. He was warmly received by PM Modi at the Palam airport. The Crown Prince is also the Vice President of the Council of Ministers and Minister of Defence of the Kingdom of Saudi Arabia. Big announcement - Saudi Arabia will invest USD 100 billion in India - a huge vote of confidence in the Indian economy. Prime Minister Narendra Modi welcomed the announcement by Saudi Crown Prince to invest in areas like energy, refining, petrochemicals, infrastructure, agriculture, manufacturing, etc. The complicity of Pakistan in Pulwama attacks was very much underlined. They (PM Modi and Saudi Crown prince) agreed on the need for creating necessary conditions for any resumption of talks. 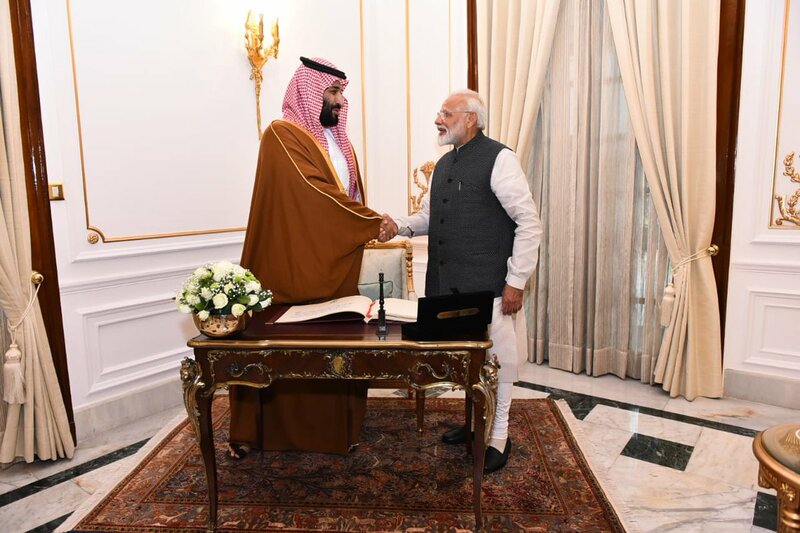 Saudi Crown Prince appreciated the consistent efforts made by PM Modi since May 2014 including his personal initiatives to have friendly relations with Pakistan. Both sides agreed on the need for creation of conditions necessary for the resumption of the comprehensive dialogue. 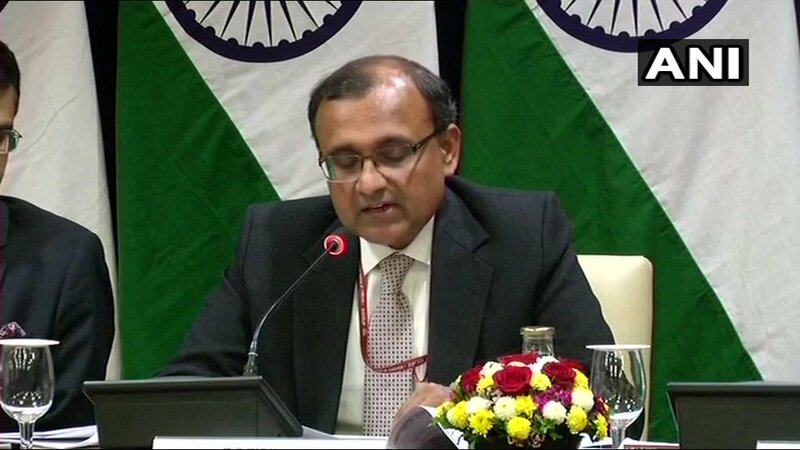 In a press briefing, MEA says: "The two leaders (PM Modi and Saudi Crown Prince Mohammed bin Salman) condemned in the strongest terms the recent terrorist attack on Indian forces in Pulwama in Jammu and Kashmir. They underlined the importance of comprehensive sanctioning of terrorists and their organisations by the United Nations. Here's a list of MoUs and Agreements signed during State Visit of Crown Prince of Saudi Arabia to India. Saudi Crown Prince is on a two-day visit to India. Memorandum of Understanding on investing in the National Investment and Infrastructure Fund between the Government of the Republic of India and the Government of the Kingdom of Saudi Arabia. Memorandum of Understanding on Cooperation in the field of Tourism between the Ministry of Tourism of the Republic of India and the Saudi Commission for Tourism and National Heritage of the Kingdom of Saudi Arabia. Memorandum of Understanding between the Government of the Republic of India and the Government of Saudi Arabia for Cooperation in the Field of Housing. Framework Cooperation Program between Invest India of the Republic of India and Saudi Arabian General Investment Authority of the Kingdom of Saudi Arabia on Enhancing Bilateral Investment Relations. 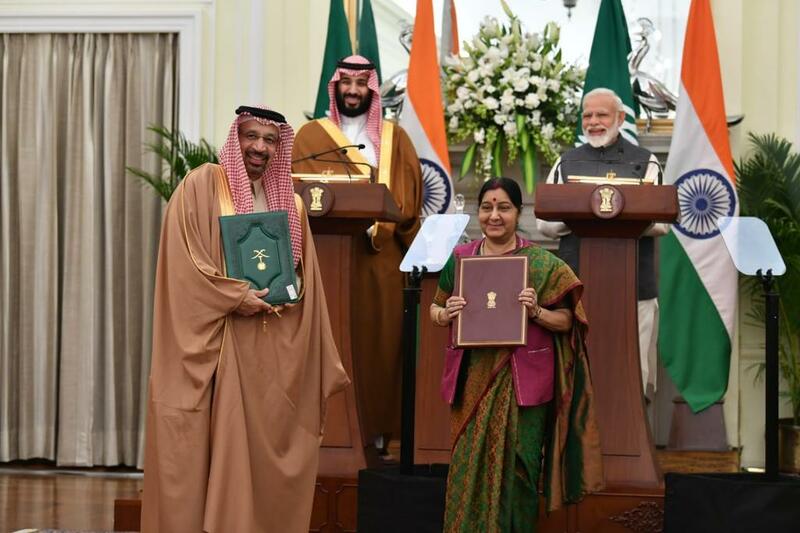 MoU for Cooperation on Broadcasting between Prasar Bharati, New Delhi, India and Saudi Broadcasting Corporation (SBC), Saudi Arabia for Exchange of Audio Visual Programme. 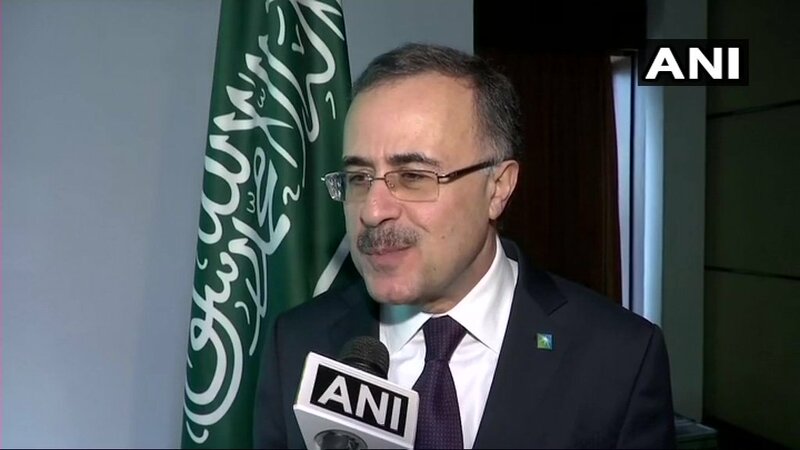 Saudi Aramco CEO Amin Nasser said that he was positive about the investment made in India. "We are working with our partners Indian Oil, Bharat Petroleum and Hindustan Petroleum. We are very positive about our investment in India. With regard to Ratnagiri, the 1.2 million barrel refinery, we are very positive about the outcome." Prime Minister Narendra Modi said on Wednesday said that India and Saudi Arabia agree that there is a need to increase all possible pressure on countries supporting terrorism. Both the leaders explored ways to further deepen strategic ties against the backdrop of escalating tensions between India and Pakistan following the Pulwama terror attack. Five documents were exchanged in the presence of Prime Minister Narendra Modi and Saudi Crown Prince Mohammed bin Salman in areas of investment, tourism, housing and information and broadcasting. Prime Minister Narendra Modi and Saudi Crown Prince Mohammed bin Salman held talks on key areas of mutual interest-trade and investment, energy, defence and security, nuclear and space, civil aviation, renewables, counter-terrorism, community welfare and regional challenges. On terrorism, Saudi Crown Prince Mohammed bin Salman said, "We will cooperate with India, including by intelligence sharing." In his remark on terrorism, the Saudi Crown said that terrorism has been a common concern but avoided taking name of Pakistan. He also skipped referring to the Pulwama attack that was carried out Pak-based terror group JeM. PM Modi also welcomed Saudi Arabia joining the International Solar Alliance. He said, "We also discussed how to further strengthen our defence cooperation." PM Modi said that he and Saudi Arabia Crown Prince also discussed about the terrorism and agreed to fight against it together. He said that terrorism is a threat to the world and we need to fight unitedly. Modi added that both India and Saudi Arabia are on the same page in fight against terrorism. PM Narendra Modi said that Saudi Arabia is one of India's most valuable strategic partners. Our relations have grown stronger. I welcome Saudi investment in Indian infrastructure. Modi also said that he and Saudi Crown Prince agreed for holding bi-yearly summit. Prime Minister Narendra Modi and Saudi Arabia Crown Prince Mohammed bin Salman witness the exchange of MoUs between the two countries. Delhi: Earlier visuals of delegation level talks between India and Saudi Arabia at Hyderabad House. During the delegation level talks, PM Modi is expecte to strongly take up the issue of cross border terrorism and the support Pakistan was extending to terror groups carrying out attacks on India. Moammed bin Salman is on a three-nation diplomatic tour to Pakistan, India and China. On the final stop of his regional tour, Crown Prince Mohammad bin Salman will meet with Chinese President Xi Jinping. The 2016 joint statement made during PM Modi's visit to Saudi Arabia in 2016 had called on countries not to allow their territory being used for perpetrating terrorism. It had called on all states to reject the use of terrorism against other countries, dismantle terrorism infrastructure where they happen to exist, and "cut off any kind of support and financing to the terrorists operating and perpetrating terrorism from their territories against other states, and bring perpetrators of acts of terrorism to justice". Prime Minister Narendra Modi and Saudi Crown Prince Mohammad Bin Salman hold bilateral talks at Hyderabad House. Today is the second and last day of Crown Prince's India visit. EAM Sushma Swaraj called on Saudi Crown Prince of Mohammed Bin Salman. MEA spokesperson Raveesh Kumar tweeted that the leaders discussed about relationship in various fields - from trade & investment to defence & security, and regional cooperation. A royal welcome! the MEA said in a tweet as Saudi Crown Prince Mohammed Bin Salman inspected the Guard of Honour at the President's House. The bilateral trade was 27.48 billion dollars during the last financial year 2017-18, making Saudi Arabia India’s 4th largest trading partner. Saudi Arabia contributes significantly to India’s energy security needs by supplying about 20 per cent of crude requirements to India. About 2.7 million strong and vibrant Indian community forms the largest expatriate group in Saudi Arabia. Saudi Prince Mohammed Bin Salman in India Live Updates: "We can create good things for Saudi Arabia and India"
Saudi Crown Prince Mohammad Bin Salman was given Guard of Honour at Rashtrapati Bhavan. Today is the second and last of his India visit. The Crown Prince and PM Narendra Modi will hold bilateral talks later today. India and Saudi Arabia will look at enhancing defence ties including having a joint naval exercise. A joint statement by Riyadh-Islamabad on Monday said there was a need to avoid politicisation of the UN listing regime, an apparent reference to India’s efforts to list Pakistani terrorist Masood Azhar as a global terrorist. This visit of Saudi Crown Prince follows a trip by Prime Minister Narendra Modi to the Kingdom in April 2016 during which the two countries agreed to elevate their strategic partnership. PM Narendra Modi will host a lunch in honour of the Crown Prince at Hyderabad House on Wednesday. New Delhi and Riyadh will set up a 'Strategic Partnership Council' at the ministerial level to deepen partnership in areas like political, security, trade, investment and culture. The Crown Prince arrived in Delhi on a less than 30-hour visit. The visit comes after his high-profile tour of Pakistan where he said dialogue was the only way to resolve "outstanding issues" between India and Pakistan. Salman was on a two-day visit to Pakistan. However, he returned to Saudi Arabia to make his India visit standalone. The Crown Prince will hold delegation-level meetings with Prime Minister Modi on Wednesday to take forward the the existing strategic partnership between the two countries. He is accompanied by a high-level official delegation as well as a large business delegation. The Crown Prince will also call on President Ram Nath Kovind later in the day. He will leave New Delhi around 11:50 PM on Wednesday. 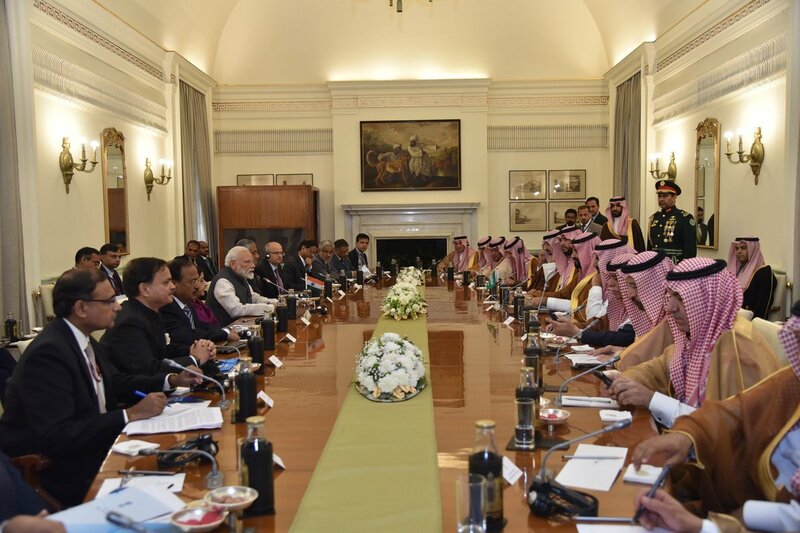 During the two-day visit, India and Saudi Arabia are expected to announce a ministerial-level 'Strategic Partnership Council' with the issue of terrorism expected to figure in a major way during the talks in the aftermath of Pulwama terror attack. Prime Minister Narendra Modi broke protocol to personally receive Saudi Crown Prince Mohammed bin Salman, who is on his first state visit to India, at the Palam airport in Dellhi. Prince Mohammed came to India a day after his visit to Pakistan. He was received by Modi with a warm hug. The Crown Prince had flown back to Saudi Arabia from Pakistan before coming to India. Prime Minister Narendra Modi is likely to raise the issue of Pakistan-sponsored terrorism with Saudi Arabia's Crown Prince Mohammed bin Salman. The Saudi Crown Prince's visit comes in the backdrop of the escalating tension between India and Pakistan following the Pulwama terror attack carried out by Pakistan-based Jaish-e-Mohammad. The Crown Prince will leave New Delhi around 11:50 PM on Wednesday. Prime Minister Narendra Modi personally received Crown Prince of Saudi Arabia Crown Prince Mohammed bin Salman at the airport in New Delhi. Mohammed Bin Salman is on his first bilateral visit to India! Breaking protocol, Prime Minister Narendra Modi personally received Crown Prince of Saudi Arabia HRH Prince Mohammed bin Salman bin Abdulaziz Al-Saud on his first bilateral visit to India! 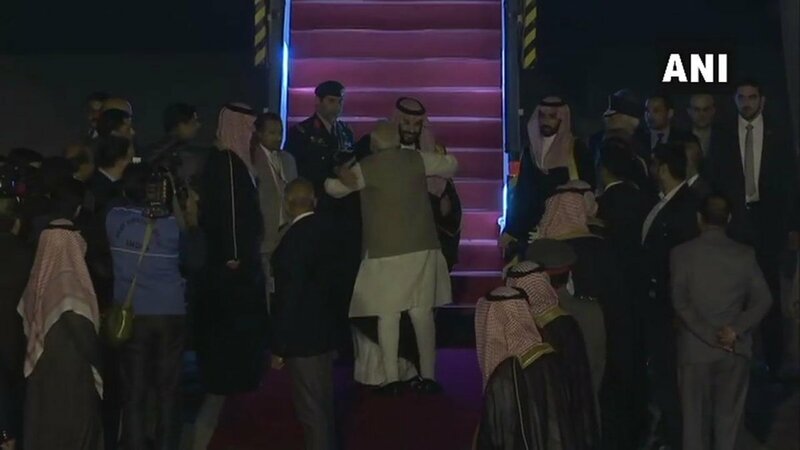 Visuals of Prime Minister Narendra Modi and Saudi Arabia Crown Prince Mohammed bin Salman upon the Saudi Crown Prince's arrival in India. Prime Minister Narendra Modi received Saudi Arabia Crown Prince Mohammed Bin Salman upon his arrival in India. Mohammed Bin Salman is on a two-day visit to India. 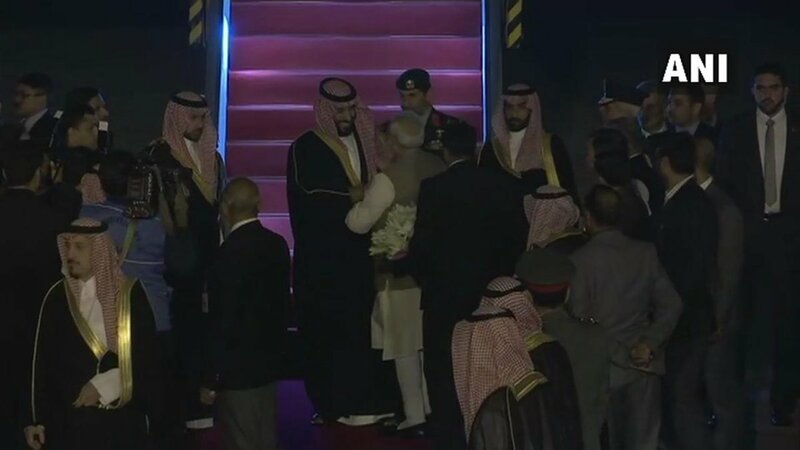 Prime Minister Narendra Modi welcomes Crown Prince of Saudi Arabia Mohammed bin Salman on his arrival at Palam airport.Salman's visit comes in the back of his trip to Pakistan where he was given a red-carpet welcome by PM Imran Khan. The maiden visit of Crown Prince follows the visit of Prime Minister Narendra Modi to Islamic country in April 2016. The two countries had agreed to further elevate existing strategic partnership. India and Saudi Arabia have historically enjoyed close and friendly relations anchored in mutually beneficial partnership and extensive people to people contacts. In recent years, there has been significant progress in bilateral cooperation in key areas of mutual interest, including energy security, trade and investment, infrastructure, defence and security.